French hi-fi has made significant inroads to the UK market in recent years, but Elipson remain one of the lesser-known brands, but this is about to change with the release of the Planet L loudspeaker. This is in spite of the fact that it has been in existence since 1938 and amongst other achievements were the default loudspeaker choice of French national television for over forty years. The striking looking Planet L is the latest in a long line of spherical designs dating back for most of the history of the brand. Elipson says that the shape of the Planet L is the result of years of research into cabinet design. Available in black, white and red, the visual impact of a pair of speakers, each the size and shape of a bowling ball, is such that serious hi-fi or not, the Planet L makes a considerable statement about style. Each Planet L is supplied with a ring that allows it to be placed on a shelf, or table, or technically on a conventional speaker stand. We used the optional £199 floorstand for the review that attaches directly to the underside of the speaker and makes for a stable fitting. Wall and ceiling mounts are also available. Each Planet L makes use of a 6.5-inch paper driver with a coaxially mounted soft-dome tweeter. A small rear port provides bass re-enforcement and a single pair of binding posts protrudes from the rear. Sensitivity is quoted at 90dB/w with impedance given as six ohms, so while not hugely sensitive, the Elipson ought to provide no real problems for a similarly priced amplifier. Fit and finish is top-notch with flawless paint, a solid-feeling enclosure and magnetic trim tabs for the grille. Given that the grille is pretty much acoustically transparent and removing it rather spoils the lines, we kept it in place for most of the listening. There is no shortage of £600 standmounts and most of them look more 'normal' than the Elipson does, but the Planet L has to be considered good value. The speaker is solid, well thought out and uses good-quality components. The stands are a little pricey (bespoke designs often are), but overall it feels good value for money. Any lingering perception that the Planet L is some sort of lifestyle trinket is destroyed shortly after you put some music through it. Placed roughly 20 centimetres from a rear wall with a little toe-in, the speaker shows some star qualities. The coaxial driver arrangement gives it a focus and soundstage that is uncannily accurate and extremely detailed. 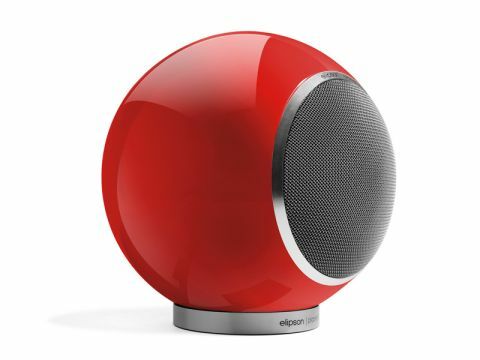 The Elipson also has a relatively wide 'sweet spot', that means it can produce an appealing presentation over a wider area than is usually the case for speakers of this size. The Planet L is also capable of extracting nuances from recordings that even considerably more expensive speakers can fail to reproduce. Tonality is exceptionally good and it rarely sounds anything other than utterly believable and very assured. The spherical shape is no gimmick either. The Planet L has very little in the way of colouration that can be traced to the cabinet and the bass port is commendably well behaved. Bass output is not seismic – there are a number of similarly priced standmounts (to say nothing of floorstanders) that will go deeper, but the bass on offer here is very clean and incredibly fast. Pushed to high levels, the Planet L will harden up, but it does so relatively slowly and benignly. They are not going to generate rock gig volume levels and those looking to fill a barn conversion might want to look elsewhere (or at least look at using more than two of them), but for an ordinary lounge, the Elipson should have no trouble strutting its stuff. Whether it's right for you will ultimately depend on whether you like the distinctive look. If you do, this is an incredibly gifted loudspeaker with a genuine talent for making music and bringing detail to the fore. What further recommendation do you need?